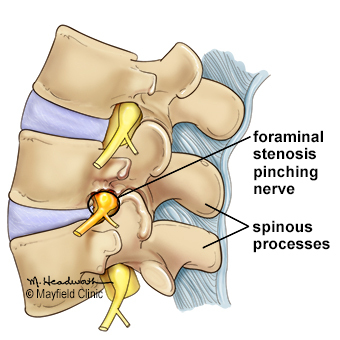 Spinal stenosis is the narrowing of the bony canals through which the nerves and spinal cord pass. Arthritis can cause the facet joints and ligaments to enlarge and thicken, restricting the space for the nerves to move freely. The pinched nerves become inflamed and cause pain, cramping, numbness or weakness in your legs, back, neck, or arms. Medications, physical therapy and spinal injections can help control the symptoms. Chronic symptoms may require surgery to open the canals. Your spine is made of 24 moveable bones called vertebrae. The vertebrae are separated by discs, which act as shock absorbers preventing the vertebrae from rubbing together. Down the middle of each vertebra is a hollow space called the spinal canal that contains the spinal cord, spinal nerves, ligaments, fat, and blood vessels. Spinal nerves exit the spinal canal through the intervertebral foramen (also called the nerve root canal) to branch out to your body. Both the spinal and nerve root canals are surrounded by bone and ligaments. Bony changes can narrow the canals and restrict the spinal cord or nerves (see Anatomy of the Spine). Figure 1. In a normal vertebra, the spinal canal and the nerve root canals have ample space for passage of the spinal cord and nerves. In spinal stenosis, bone spurs, enlarged facet joints and a bulging disc constrict the nerve root canals causing compression and entrapment of the spinal nerves; also called lateral or foraminal stenosis. Central stenosis occurs when the central spinal canal is constricted with enlarged ligament and bony overgrowth, causing compression of the spinal cord and cauda equina. Stenosis can occur along any area of the spine (cervical, thoracic, lumbar), but is most common in the lumbar area. Nearly every adult's spinal canal narrows with age; however, for most people this does not cause symptoms. Narrowing of the nerve root canal (lateral stenosis) presses on the spinal nerves, causing inflammation and pain. Narrowing of the spinal canal (central stenosis) presses on the spinal cord causing inflammation and weakness. Symptoms usually develop over time or may occur as a sudden onset of pain. You may feel a dull ache or sometimes sharp and severe pain in different areas, depending on which part of the spinal canal has narrowed. The pain may come and go or only occur during certain activities, like walking. Lumbar stenosis may cause pain as well as tingling or numbness that starts in the buttocks and radiates down the back of both thighs and sometimes into the calves, called sciatica. Stenosis also causes neurogenic claudication, a cramping pain and weakness in the legs, typically the calves, that occurs with walking or standing and goes away with sitting and rest. Over time the symptoms increase, reducing one’s physical endurance. Leaning over a supporting object, such as a walker or shopping cart, can help reduce the pain when walking. Leg pain and cramping can also be a sign of vascular claudication, which occurs when there's a narrowing of the arteries in the leg caused by peripheral artery disease. Pain occurs because your leg muscles are not getting enough blood. It’s important that the doctor determine if your leg symptoms are caused by peripheral artery disease or lumbar stenosis. A key difference is that vascular claudication is worse when walking uphill and is not relieved by bending forward. Cervical stenosis may cause pain as well as tingling or numbness that radiates from the neck, down the shoulders and into the arms and hands. Pressure on the spinal cord, as it runs through the cervical spine, can cause weakness and spasticity in the arms and legs, called cervical spondylotic myelopathy. Spasticity means you lose control over your muscles and have difficulty walking, placing your feet, or dropping objects. You may have trouble with balance and coordination such as shuffling or tripping while walking. If you experience extreme leg weakness (foot drop) or difficulty controlling your bladder or bowel function, seek medical help immediately. This is a sign of cauda equina syndrome. As you get older, your bones undergo degenerative changes that are part of the natural aging process. Osteoarthritis is the most common cause of spinal stenosis. The cushioning disc between your vertebrae dries out and shrinks. You lose bone mass. Bone spurs develop. Your facet joints can enlarge because of strain and stress. This is the body's attempt to spread stress over a larger area. 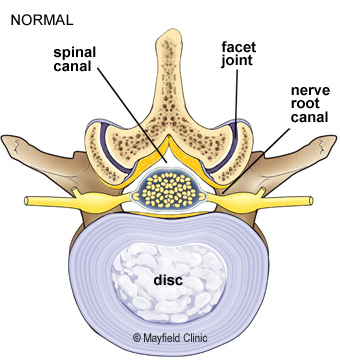 The larger a facet joint becomes, the less space is available for the spinal nerve as it exits the nerve root canal. 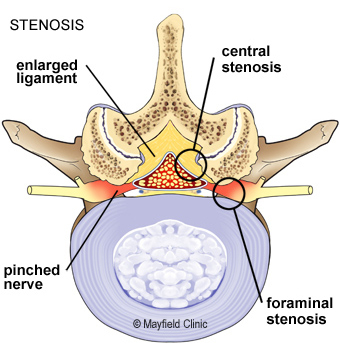 Stenosis can also be caused by other degenerative conditions such as spondylosis or spondylolisthesis; traumatic injury, vertebral fracture, and dislocation; skeletal conditions such as rheumatoid arthritis or ankylosing spondylitis; or metabolic conditions such as Paget's disease or fluorosis, an excessive level of fluoride in the body. Stenosis affects both men and women and is most common between the ages of 50 and 70. It also may occur in younger people who are born with a narrow spinal canal or who experience an injury to the spine. When you first experience pain, consult your family doctor. Your doctor will take a complete medical history to understand your symptoms, any prior injuries or conditions, and determine whether any lifestyle habits are causing the pain. Next a physical exam is performed to determine the source of the pain and test for any muscle weakness or numbness. Your doctor may order one or more of the following imaging studies: X-ray, MRI scan, myelogram, CT scan, or arterial Doppler study. Based on the results, you may be referred to a neurologist, orthopedist, or neurosurgeon for treatment. Magnetic resonance imaging (MRI) is a noninvasive test that uses a magnetic field and radiofrequency waves to give a detailed view of the soft tissues of your spine. Unlike an X-ray, nerves and discs are clearly visible. It may or may not be performed with a dye (contrast agent) injected into your bloodstream. Besides nerve compression, MRI can also detect bony overgrowth, spinal cord tumors, or abscesses. Myelogram is a specialized X-ray where dye is injected into the spinal canal through a spinal tap. An X-ray fluoroscope then records the images formed by the dye. Myelograms can show a nerve being pinched by a herniated disc, bony overgrowth, spinal cord tumors, and spinal abscesses. The dye used in a myelogram shows up white on the X-ray, allowing the physician to view the spinal cord and canal in detail. This test may be followed by a CT scan. Computed Tomography (CT) scan is a safe, noninvasive test that uses an X-ray beam and a computer to make 2-dimensional images of your spine. It may or may not be performed with a dye (contrast agent) injected into your bloodstream. It is especially useful for viewing changes in bony structures. Doppler ultrasound is a noninvasive test that uses reflected sound waves to evaluate blood as it flows through a blood vessel. This test may be performed to rule out peripheral artery disease as a cause of painful leg symptoms. There are no medications or treatments that can stop or cure spinal stenosis. Conservative, nonsurgical treatment is the first step to controlling mild to moderate symptoms of spinal stenosis. However, if you have severe disabling pain and significant difficulty walking, your doctor may recommend surgery. Self care: Using correct posture (see Posture & Body Mechanics) and keeping your spine in alignment are the most important things you can do for your back. The lower back (lumbar curve) bears most of your weight, so proper alignment of this section can prevent injury to your vertebrae, discs, and other portions of your spine. You may need to make adjustments to your daily standing, sitting, and sleeping habits. You may also need to learn proper ways to lift and bend. You may be able to slow down the progression of stenosis by not smoking and maintaining a weight that's appropriate for your height and body frame. Physical Therapy: The goal of physical therapy is to help you return to full activity as soon as possible. Physical therapists can instruct you on proper posture, lifting, and walking techniques, and they’ll work with you to strengthen your back, leg, and stomach muscles. They’ll also encourage you to stretch and increase the flexibility of your spine and legs. Exercise and strengthening exercises are key elements to your treatment and should become part of your life-long fitness. Check with your doctor before you begin any new exercise program. Nonsteroidal anti-inflammatory drugs (NSAIDs), such as aspirin, naproxen (Aleve, Naprosyn), and ibuprofen (Motrin, Nuprin, Advil) are used to reduce inflammation and relieve pain. Analgesics,such as acetaminophen (Tylenol), can relieve pain but don't have the anti-inflammatory effects of NSAIDs. Long-term use of analgesics and NSAIDs may cause stomach ulcers as well as kidney and liver problems. Steroids can be prescribed to reduce the swelling and inflammation of the nerves. They are taken orally (as a Medrol dose pack) in a tapering dosage over a 5-day period. They have the advantage of providing pain relief within a 24-hour period. Steroid injections: This minimally invasive procedure is performed with x-ray guidance and involves an injection of corticosteroids and a numbing agent into the spine. The medicine is delivered right into the painful area to reduce the swelling and inflammation of the nerves. Repeat injections may be given to achieve full effect. Duration of pain relief varies, lasting for weeks or years. Injections are done in conjunction with a physical therapy and/or home exercise program to strengthen the back muscles and prevent future pain episodes. Epidural steroid injections: An injection of corticosteroid and an analgesic-numbing agent is delivered into the epidural space of the spinal canal or nerve root canals to reduce the swelling of the spinal nerves. Facet injections: An injection of corticosteroid and an analgesic-numbing agent is delivered directly into the painful facet joint. Chiropractic: Spinal adjustment is a treatment that applies pressure to an area to align the bones and return joints to more normal motion. Good motion helps reduce pain, muscle spasms or tightness, and improves nervous system function and overall health. Motion also reduces the formation of scar tissue, which can lead to stiffness. Holistic therapies: Some patients find acupuncture, acupressure, yoga, nutrition / diet changes, meditation and biofeedback helpful in managing pain as well as improving overall health. Surgery for spinal stenosis involves removal of the bony overgrowth to relieve pressure and pinching of the spinal nerves. Another goal of surgery is to stop painful motion of an unstable spinal segment. Spinal decompression (laminectomy): An incision is made in the middle of the back. The spinal muscles are moved aside to expose the bony vertebra. The arched portion of the vertebra, called the lamina, is removed (laminectomy) to expose the spinal cord and nerves (Fig. 2). Thickened ligaments and bone spurs are removed. The overgrown facet joints, located directly over the nerve roots, may be trimmed to give more room for the spinal nerves to exit the spinal canal. If there is a herniated disc, a discectomy may be performed. In patients with severe symptoms of lumbar spinal stenosis, decompression surgery alone is effective approximately 80% of the time . Figure 2. A laminectomy involves removal of the entire lamina and ligament – opening up space for the nerves to move freely. Multiple laminae can be removed. Spinal fusion: In patients with stenosis and spinal instability or slippage of one vertebra over another (spondylolisthesis), the surgeon may recommend to permanently join together two or more vertebrae to give your spine more stability. This is usually done at the same time as a laminectomy. Bone grafts, usually from your own hip or from a bone bank, are placed across several vertebrae where the lamina was removed. 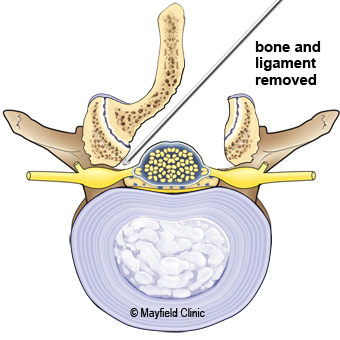 Over time (3 to 6 months) the bone graft will fuse the vertebrae into one solid piece of bone. Metal plates and screws may be used to immobilize the area while fusion is created (Fig. 3). Figure 3. Spinal fusion restores the normal height of the disc space and prevents abnormal movement. Laminoplasty. This procedure is performed only in the neck (cervical) when multiple levels of the spine are affected by stenosis. It opens up the space within the spinal canal by creating a hinge on the lamina and opening a door to the canal (Fig. 4). A metal plate bridges the gap in the opened section. Figure 4. 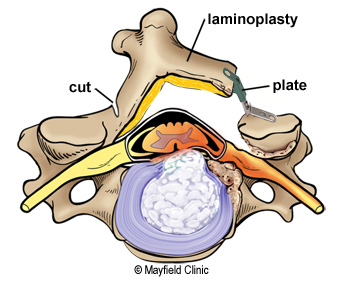 Laminoplasty surgery creates a door hinge to open and widen the spinal canal, giving more room for the spinal cord. 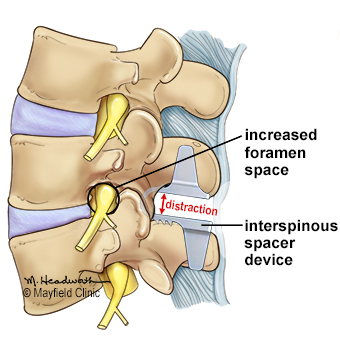 Interspinous process distraction: A spacer device is inserted between the spinous processes – the bony protrusions along the back of the lumbar spine. Once in place, the spacer lifts and opens the spinal canal as if one were in a seated position rather than a standing position, effectively relieving the pressure on the spinal nerves (Fig. 5). 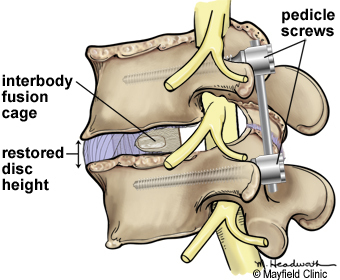 The spacer device is not attached to bone or ligament and does not result in spinal fusion. The surgery is minimally invasive and can be done under local anesthetic. Because interspinous spacers are relatively new , the long-term effectiveness is not known. Also, not all insurance companies will pay for this technology and out-of-pocket expenses may be incurred. Figure 4. A spacer device is inserted between the spinous processes of the lumbar spine to lift and open the spinal canal, relieving the pressure on the spinal nerve. Clinical trials are research studies in which new treatments - drugs, diagnostics, procedures, vaccines, and other therapies - are tested in people to see if they are safe and effective. You can find information about current clinical investigations, including their eligibility, protocol, and participating locations, on the web at: the National Institutes of Health (NIH) at clinicaltrials.gov and www.centerwatch.com. If you have questions, please contact Mayfield Brain & Spine at 800-325-7787 or 513-221-1100.
ankylosing spondylitis: a chronic inflammatory disease that affects the joints between the vertebrae of the spine, and the joints between the spine and the pelvis. It eventually causes the affected vertebrae to fuse or grow together. fluorosis: a condition caused by consuming too much fluoride in which the teeth and bones are abnormally brittle. laminectomy: surgical removal of the laminae or vertebral arch of the vertebra to remove pressure on the spinal cord. neurogenic claudication: a pain syndrome in the back and legs aggravated by walking and relieved by sitting or bending forward, also called pseudoclaudication. Paget's disease: also known as osteitis deformans, a bone disease in which normal bone is destroyed and then replaced with thickened, weaker, softer bone. This weaker bone easily bends and deforms. Most often effects the pelvis, thoracic and lumbar spine, skull, femur, tibia, fibula, and clavicles. radiculopathy: refers to any disease affecting the spinal nerve roots. Also used to describe pain along the sciatic nerve that radiates down the leg. spondylolisthesis: when one vertebra slips forward on another. spondylolysis: a spinal instability in which there is a weakness between the body of a vertebra and the pedicle. vascular claudication: a cramping pain and weakness in the legs, typically the calves, that occurs with walking and goes away with rest. Caused by poor blood circulation in the legs (peripheral artery disease) or compressed spinal nerves (spinal stenosis). Mayfield Certified Health Info materials are written and developed by the Mayfield Clinic. This information is not intended to replace the medical advice of your health care provider. Patients who come to Mayfield with neck or back problems are given a rapid review of their medical condition within a few days, not weeks. It's a treatment process called Priority Consult. Nearly 80 percent of our spine patients are able to recover with nonsurgical treatment. But when physical therapy, medications, and spinal injections fail to relieve pain, we help patients with surgery. We treat thousands of patients with spinal stenosis each year. Many Mayfield patients have the option of same-day, outpatient surgery at our spine surgery center. Webinar: Lumbar Stenosis - Diagnosis and Treatment Options with Dr. Brad Curt.